As a serious Project Management Professional (PMP®) aspirant, how much are you doing for your examination? Studying hard? Yes. Reading the best books? Yes. Revising lessons time and again? Maybe, yes as well. But is it enough? Sadly, no, it isn’t. Just like any other competitive exam, you need to practice lot of questions. Unless you solve full-length question paper, you won’t be able to judge the level of your preparation or be fully confident. You may feel that knowing the entire syllabus, reading the best materials is enough to crack this exam. However, considering the increasing level of difficulty and the kind of tricky questions asked these days, with all due respect to your books and study content, it is not enough. Unless you solve complete exam sets, you cannot be sure of your preparation. Undoubtedly, you may have studied a lot from the best sources. However, until you apply your knowledge in solving questions, you cannot have a strong preparation. Hence, to improve your preparation, PMaspire provides unlimited full-length question sets with timer as per the PMP® Exam standards. Further, if you feel the need to take up tests on specific portions, you have the option of generating your desired test to test your knowledge in that particular area. The Best PMP® Exam Simulator also displays in-depth explanations to every question. Analyzing the solutions, you shall be able to clear concepts, broaden information domain and integrate maximum knowledge. Therefore, from questions to answers, you get everything within your reach. Equipped with latest technology, PMaspire facilitates user-friendly exam modules and features. It is highly responsive, so from whichever device you attempt an exam; it easily fits within your screen. Test loading time is also the fastest, compared to other platforms. In addition to these, the Best PMP® Exam Simulator is located in a cloud environment; thereby enabling you to access any information on-the-go. The flexible and dynamic interface also enhances your site experience besides fulfilling your requirements in the blink of an eye. You will also agree that just solving the papers and knowing the answers is not sufficient for solid preparation. It is important to analyse your performance over a time period. With the help of PMaspire, you can get real-time performance analytics through which you can judge your current standing. See the areas where you have excelled, where you still lag and where you have become weak. Based on such metrics, you can frame your immediately strategy to overcome all barriers, strengthen your strong portions and be successful in this examination. Best PMP® Exam Simulator takes you way ahead in terms of study materials. From March 2018, it has started delivering the Sixth version of PMBOK® Guide and it will continue for the next 4 years. Besides these, the portal also enables you to have a Free!! Trial of the Best PMP® Exam Simulator and get the experience before subscribing to it. 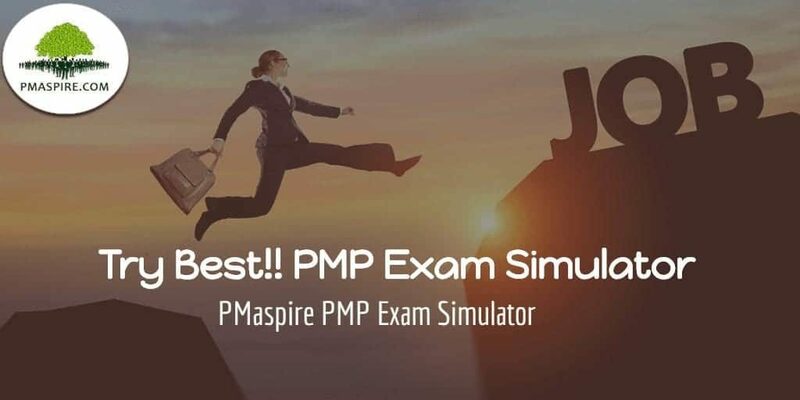 With all such marvelous features, PMaspire is dedicated to deliver the best possible means and resources for cracking the PMP® Exam at one go. Considering its tech-savvy attributes, user-friendly modules, greater convenience and latest content version, it is worth trying out. If you would like to experience a true Online PMP® Exam Simulator for FREE. Click here to Register. *PMP® is a registered Trade Mark of Project Management Institute.